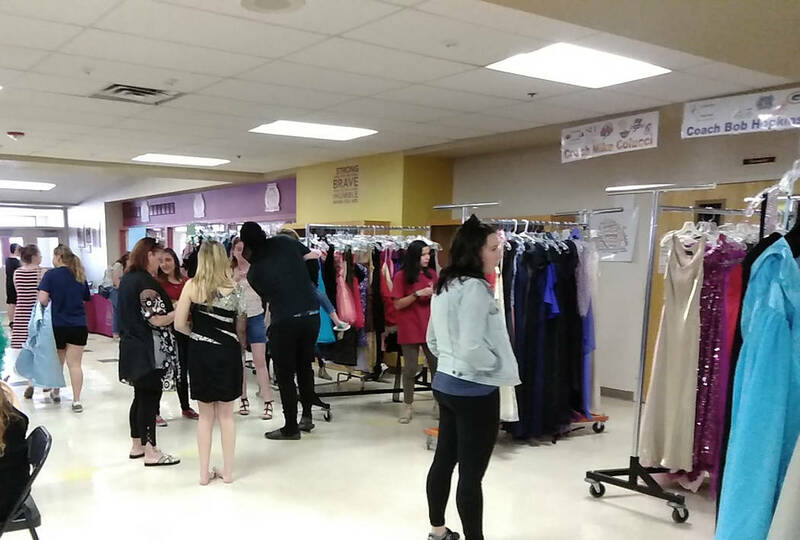 Selwyn Harris/Pahrump Valley Times Scores of Pahrump Valley High School students visited Saturday's "Prom Closet" event in hopes of finding a brand new outfit for next month's May 4, prom at Mountain Falls. The Prom Closet was founded by a Las Vegas organization known as Project 150. 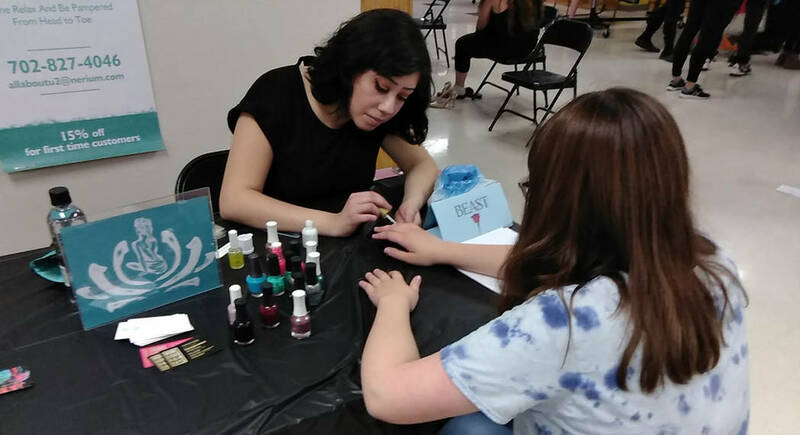 Selwyn Harris/Pahrump Valley Times Professional nail stylists and fashion consultants were also on hand providing free services and advice for students attending this year's Pahrump Valley High School Prom. 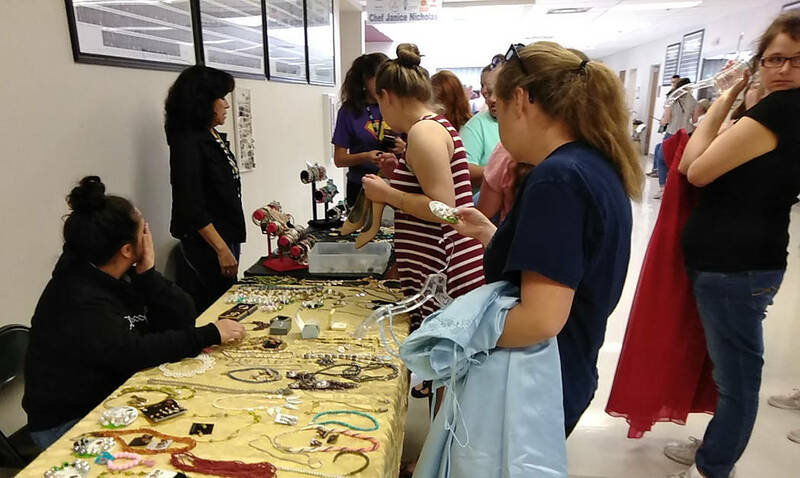 Selwyn Harris/Pahrump Valley Times A generous donation of high quality costume jewelry and fashion accessories were also part of the items offered to Pahrump Valley High School junior and seniors this year. The Prom Closet program has been offered in Pahrump for the past 3 years. The May 4th event, according to Registrar Jennifer Shockley, will run from 6 to 10 p.m. The venue is located at 5001 Clubhouse Drive on the south end of town. Shockley noted that the students, by and large, nixed the idea of having the event at the high school. Unfortunately, for the students and parents looking to save some money on prom tickets, that ship has since sailed, as the cutoff date for discount tickets ended on Saturday, where they were $45 for a single or $80 for a couple. Prices leading up to the night of the prom are now $50 per person and $90 per couple. Despite the amount, Shockley is anticipating a large turnout. It’s safe to say that many of those students attending prom will wear brand new formal attire courtesy of the school’s Prom Closet, which opened on Saturday, April 13. An organization known as Project 150 from Las Vegas provided the Prom Closet attire to any and all students attending this year’s prom. The program allows students with limited options for prom attire, to select items, from head to toe, at no cost. Pahrump Valley High School senior Sabrina Jaynes organized and oversaw Saturday’s Prom Closet event, now in its third year. Nye County School District Liaison Linda Fitzgibbons was on hand to provide assistance with the Prom Closet event.